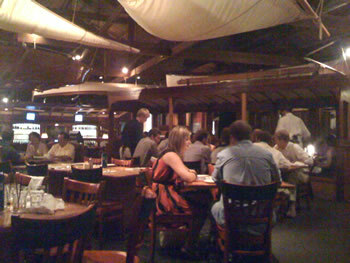 We were tempted to try the Boathouse as we passed by it on our way to downtown. This restaurant has great curb appeal that continues on the inside as well. We were really impressed with our dinners. My husband got lobster which was good but the King Crab legs were the star of the evening with my roasted grouper over grits topped with a tomato and wild mushroom ragout being a close second. Both plates were licked clean. Everything was very fresh and plated beautifully. My kids had enjoyable meals as well. The only down side of the evening was their lackluster desserts. The keylime pie was the best one and we tried three of them. I won't say which ones as you should give them a try yourself and see what you think. I highly recommend this restaurant for ambiance and food. I hope to go again next time I'm in Charleston! Great food and, customer service; too bad they don't have a restaurant. The prices are very affordable. Best Greek food I've ever eaten. We stop to eat everytime we visit Charleston. This food was the Bomb! The Re Rice Crab Cakes and Fried Shrimp is to die for! Great seafood, especially for an outdoor event! We've ate at several restaurants that can't compare to them. They should have a store front... Keep up the good work!